Guarantee: Ramhorn will replace new one for any damage or defect for any reasons free of changer within three years. If you have any questions, please contact us as soon, we will do our best to help you solve. 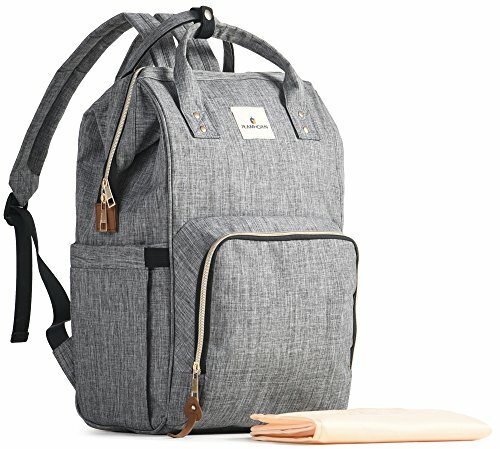 Multi-function and Value: The diaper bag has a stylish look, and diaper backpack also provides you with a pleasant and satisfying organizational condition. The nappy bag can be used as a backpack, handbag or tote bags and suitable for family travel, shopping etc. Choose Ramhorn baby diaper bag, will be the best decision for mom. Practical and Capable：High quality, durable fabric and large capacity with lightweight, waterproof, easy to clean. No longer need to worry about the liquid splashed on the diaper bag, a gently wiping could reappear the original clean. A separate insulated bottle pocket with baby diaper bag can avoid the heat generated by milk fever, and keep the milk a few hours of insulation with fresh, for you and your baby to provide safe and reliable quality service. Satisfied Storage: Wide open designed, the rationality of diaper bag design can make you better and faster to pick and place items. The diaper bag backpack has insulated milk bottle pockets, side tissue pockets, diaper changing pad, adjustable backpack straps, Large capacity storage, to meet your and your baby's daily needs. To provide you with a comfortable and happy baby care experience, and create a harmonious and happy family atmosphere. Perfect Gift: The Ramhorn diaper bag suitable for giving baby boy or baby girl. The diaper bag's neutral colors and classic styles are suitable for Dad's outing or mom. With a button that can lock both the upper handles to hang the bag conveniently on a stroller, it proves ideal for baby care during traveling, equally suitable for women's & men.